I am often asked, "Aren't you afraid" and "Do you have fears about whether you will be able to make such a journey?" YOU BET! I have fears and doubts every time I set out to row an ocean. The prospect of rowing for months by myself the more than 2,300 miles from Santa Cruz, California to Hawaii was certainly no different. Fear and doubt is a big part of what motivates me to try, and is normal. It helps drive me to succeed and makes me train and prepare to accomplish what most people consider impossible. I fear failure, but am not afraid to do extremely difficult things. I'll make a 110% effort for a chance at either succeeding or failing while being scared s**tless the entire time. Most people consider what I do crazy. I get it. The concept of one person experiencing the harsh life at sea for so much time is difficult for people to grasp, let alone when that person is a paraplegic with rods in her back. The voyage to Hawaii would be my first solo row which would make it the most difficult physical and mental challenge since my hospitalization and surgeries. 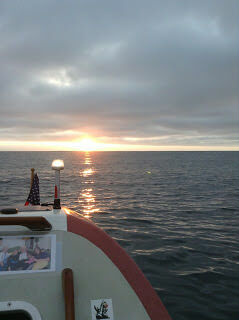 On the evening of June 9, 2013, I made my way out of the Santa Cruz Channel on my boat, Spirit of Orlando, at 5:45 pm with only mild onshore NW winds and a relatively flat sea. 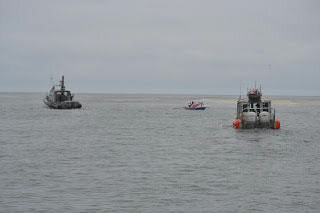 I was escorted out to the 1 mile buoy by the Harbor Patrol and the Coast Guard. The seas and winds remained calm through the night and the sky was clear enough to see many stars. I rowed all through the night making about 26 miles and rowed through the morning. The winds were increasing so I put out my parachute anchor at 1 pm to take a two hour nap. Some playful sea lions had collapsed my para anchor and were playing ball with the buoy. They saw me come out of the cabin and stopped first looking at each other, then at me and then at each other again like mischievous children. I retrieved my para anchor and continued rowing increasing my distance from land and making the most miles west I would see the entire row. The weather changed to Gale-Force 2 winds and, when it became un-rowable, I reset the parachute anchor. 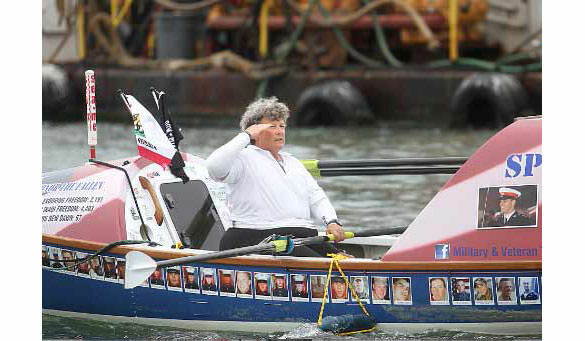 I thought about the day's events and all of the marine life I had seen in just one day of rowing. It began with the sea lions and a killer whale charging toward my boat a short time later, followed by many dolphins. Then as I was rowing, a blue whale and her calf surfaced right beside my boat. Not too long after that, I was charged by more killer whales. My previous encounters with them did not diminish the fear I felt watching them get closer. The interesting-looking jellyfish I saw floating by made me think of Diane Nyad, who swims oceans and has encounters with jellyfish. To top it all off, I was also visited by many sharks.